Welcome to the Kayden Project. 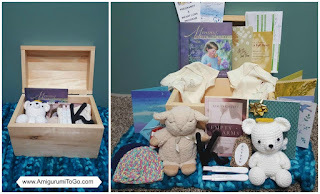 I started this project to help bring awareness to pregnancy and infant loss in memory of my niece's baby that she lost due to an ectopic pregnancy. The loss of a baby, no matter how early in the pregnancy that baby is, can cause the mother great heartache and pain. 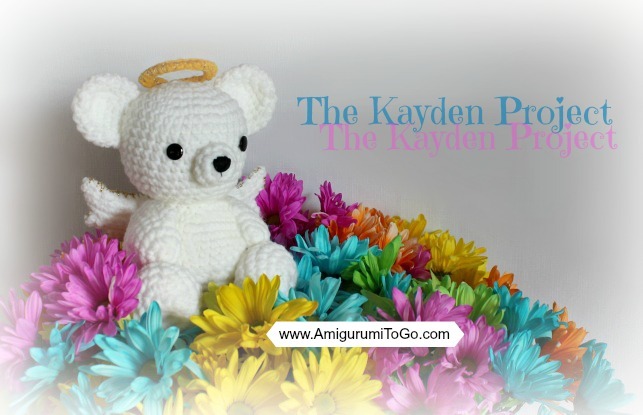 It is my hope that the Kayden Project will bring some comfort to mothers who are suffering, and give those in support of a mom who has lost her baby a better understanding of her grief. On August 28th 2015, my niece had to have emergency surgery to remove the baby. This surgery actually saved her life but she developed a depression soon after and had a very hard time coping with the loss of her baby. She also felt feelings of guilt since she had to consent to the surgery. She knew that her baby was going to die even if she didn't have the surgery, but those feelings of guilt were still there. Even though she had been pregnant for only a short time, she was in love with her baby and her mother's heart was completely broken with this loss. She grieved for many months after. Some people did not understand her grief. Some people went silent. Some people tried to help and said things they should not have said. On top of her grief that must have been extremely painful to deal with. The best thing we can do for a mother who has lost her baby is just be there. Offer support and show compassion. Do not put a time limit on her grief. Be aware that mom could be dealing with depression as well. Depression is not to be taken lightly, depression can kill. Be gentle and kind. Look into counseling services and take advantage of the help that's out there. Don't try to fix her. You can't fix her. Allow time to do the healing. Don't say things like "there's a reason for everything" or "God needed an angel so he took your baby". These may seem like good things to say but they not helpful to a grieving mother in any way. If you don't know what to say, just say, "I'm so sorry this happened. I'm here for you if you need me". While my niece was dealing with this depression she reached out to the Alberta Health Services and they were very helpful to her and connected her with a pregnancy loss counselor. The counselor suggested she make a memory box and to also name her baby. Even though this did not take the pain away she did find comfort in doing things that honored her baby. She decided on the name Kayden Josiah and filled a memory box with cards and letters she received after Kayden's passing, special things from the family and things she had already bought for the day the baby should have arrived. She even crocheted a blanket in honor of her baby. 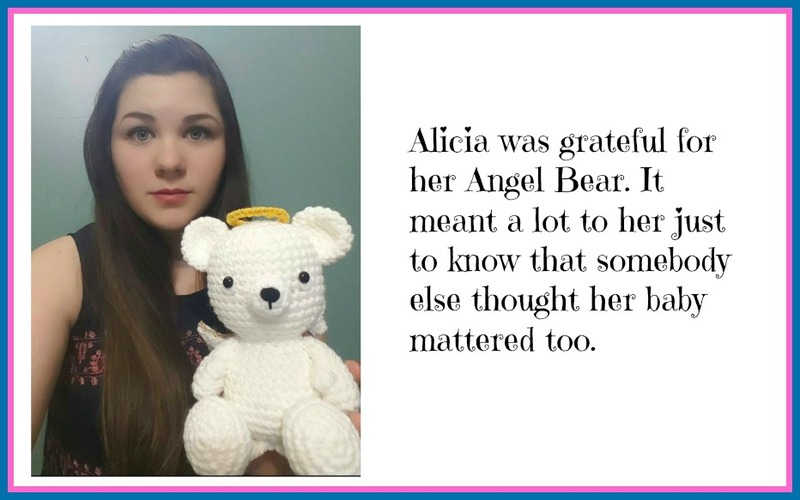 In December of 2015 I wanted to give something special, something right from my heart, so I made the Angel Bear and sent it to Alicia for her memory box. I wrote a letter that told her what an honor it was for me to be Kayden's great aunt! That will always be my special connection to this baby. Because of Kayden I became a great aunt for the first time. My parents became great grandparents for the first time too. These are all special things that we can hold onto and tell Alicia how much that means to us and that her baby mattered and is very much loved. I think one of the most important things for a mother to hear when she has had an early pregnancy loss is that her baby mattered. The Angel Bear is a free pattern that also has a video tutorial with it. You will find all the pattern and video links you need for this project here. The purpose of this project is to spread awareness. To allow people who are on the outside looking in, a glimpse into a mother's heart. To give people a better understanding that pregnancy loss, no matter what stage it was in, can cause great feelings of loss and sadness and even depression. To let mothers who have suffered a loss know that what they are feeling is completely normal. That this grief has no time limit. That their baby mattered and there is help out there for for those who need it. Thank you so much for visiting the Kayden Project. I hope you have found some comfort here. who never got to live. My prays are with your niece and you.May you both find peace and comfort with the lord.amen. This is so beautiful, Sharon. I literally burst into tears watching your video (being 35 weeks pregnant myself probably doesn't help!). I love how you're continually taking new directions with your patterns, and I hope it inspires many people to use their crochet talents to give and love and encourage. Jennifer, I can't even tell you what your message means to me. Truly, straight to my heart. I actually got the goosebumps. I love this world I'm in so much, there are so many loving, kind, beautiful souls that I get to meet because of it, like you for example, it's amazing to me. I feel blessed beyond description. I just looked up the site for Last Cuddles, wow!! I will go look further, but that is just awesome from what I just saw. Thank you for taking the time to read this post and for leaving such a beautiful comment. I appreciate it! Congratulations on your upcoming birth. And may I say, what a lucky baby to have such a generous mom. I wish you both great joy! Sharon, I am very sorry for your niece's loss. I had a miscarriage too after a lot of time trying to get pregnant and it is really painful. I hope she recovers fully and soon enough, as life itself is a gift. Bad things happen but we have to try and make the best out of it anyway. I also love your crochet designs. Crocheting helps me to focus on bright things when I'm in a brooding mood. Thanks a lot and best wishes for you and your niece! I never thought someone else would understand how I felt after my first ectopic. What your niece went through has helped me understand my own feelings and sense of responsibility for signing those consent papers. Thank you for helping me make sense of what I felt. Today I did a random Google search for crocheted stuffed animals to make for an organization needing stuffed animals to hand out to homeless children. This made me cry. It must feel terrible when people do not get it. My sister in law had an abortion after previously announcing the baby, so I grieved for the baby and felt very alone as nobody around me seemed to get it. My husband and mother in law figured the baby would have a bad life with her (she was doing lots of drugs while pregnant) and thought it was better that way. I just felt crushed, and still think about that baby. Would be around 3 years old now. I know it is not the same as losing a baby naturally, but I did not have a choice in it and I had already invisioned a new niece or nephew. I feared a miscarriage when I got pregnant as 1 in 4 was the number they told me before 12 weeks. Luckily, my daughter survived. I am sorry for those parents who were the 25%. Your story touched home as my granddaughter lost a baby in May at 36 weeks due to placenta abruption. She had to deliver knowing the baby was gone. There are rare and unforeseen events that can happen before any baby is born. As a health care professional, I can understand these events. As a grandmother, it was traumatic to endure. I am glad to see that times have changed and there is an acknowledgement of the pregnancy and recognition that there is a profound loss. Good luck to your niece and you. Thank you for your patterns. I made them and gave most away during the summer. Several weeks ago, we found out the baby my daughter-in-law was carrying no longer had a heart beat. I'm sure she cried more but the tears were there for me as well. Many people think because it wasn't born that we shouldn't grieve and it is a loss for everyone. I made the angel bear and attached the poem. In fact, I'm planning on making more bears so doctors or nurses can give them out when needed. Thank you for sharing your story. Connie. I am a photographer for Now I Lay Me Down to Sleep in Calgary. 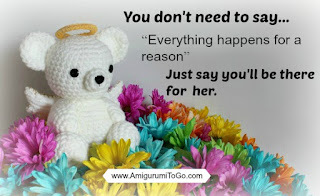 I am also a crocheter and was on the search for a pattern for a little bear so I could have some to offer parents when there aren't any available at the hospitals in their memory boxes. I just saw your pattern on Ravelry and imagine my surprise when I saw this link. It is perfect. Thank you! I was looking for wings to make angel bears for miscarried babies. I found your wing pattern and came here from it. I just miscarried my child at nearly six weeks. It really doesn't matter how early, it's horrible. We were so excited to have a sibling for our son. I had actually crocheted a teddy bear for the baby when we found out, it's all I have of them. I'd like to make these so women can have something. Around the time that I was born, a beautiful lady named Susan found out that one of her twins, at 7 months gestation, had passed away. She underwent an emergency removal operation only for the doctors to find that the second twin had also passed away. This was way back in the 60's. Then to add insult to injury, mother nature decided that she would then contend with early menopause, she was 22. I will never know the pain she felt or the emotions that she must have endured but her desire to be a mother was so strong that she decided nothing would stop her. 5 years later she finally got her wish, not just one but 5 siblings all taken into care from a terrible existence. I wish I could have made her 2 of these bears during her lifetime that sadly came to an end in 2009, but I only learned to crochet 3 years ago. She was the best mum I could have ever hoped for, the one I dreamed of in the childrens home, the one I will love forever in my heart and soul, and although I could not make her the bears I know that myself and my siblings gave her happiness and love that she missed out on with her beautiful little angels.